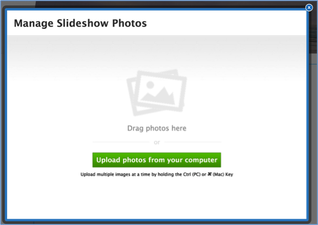 The slideshow element (available under the "Multimedia" category of elements) enables you to show off your photos with style. 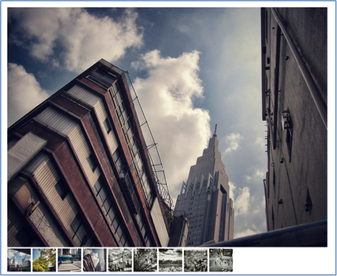 To add a slideshow, drag the element to a page on your site. 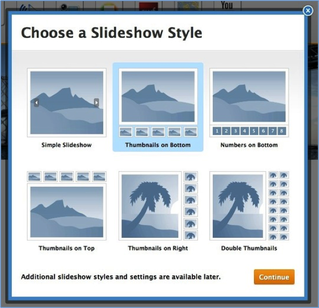 This will open the "Choose a Slideshow Style" dialog box where you can select which style of slideshow you want. This can always be changed later (we even provide more options later), so don't spend too much time worrying about which one you want. Let's select Thumbnails on Bottom for this example. You'll now be prompted to upload photos. 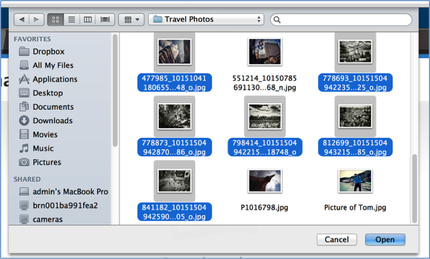 Hit the big Upload Photos button or just drag some photos into the box to get started. Then select the photos you want to upload. You can always delete photos / upload more later. Depending on how many photos you selected, it may take a few minutes to upload. Once they're done uploading you'll see them all on the photo management screen. You can drag photos to re-order them, click the 'x' next to each to delete them, and click the 'bubble' icon to add a caption that will appear along with the photo in the slideshow. When you're ready to move on, click Save and you'll see the slideshow as part of the page. Click on the slideshow to open its toolbox and make changes. Use the Add / Edit Photos button to bring up the Manage Photos dialog box we saw earlier. Use Transition Style to switch between five different photo transitions. Use Navigation to select whether you want to use Thumbnails, Numbers, or no navigation at all. Use Speed to determine how fast the slideshow should play. Use Spacing to tweak the amount of space around the image. Use Caption to determine if any text captions should appear at the top or bottom of each image. And with the Advanced option, set Autoplay to On or Off (it's on by default) and determine if you want the slideshow to always play in order or start from a random point every time the show is loaded. Note that the slideshow will automatically expand to the width of the page or column in which you've placed it. 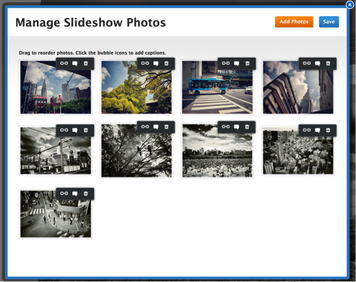 If a slideshow isn't quite your style, learn how to Upload a Gallery of Images.